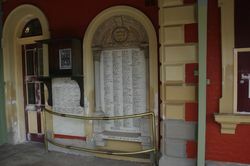 The honour roll is set into the wall of the original railway station building at Goulburn. 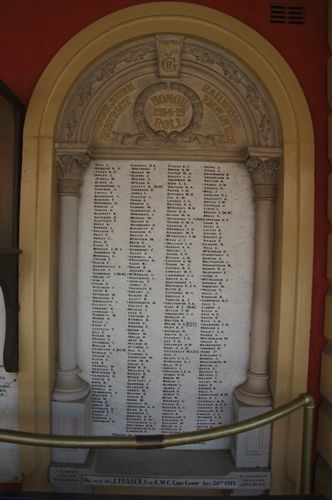 Veterans' names are engraved into a white marble plaque and blackened. The plaque has stone pillars on either side and a semi-circular carved top above. Carvings include a laurel wreath and leaves around the perimeter. The double ceremony of unveiling the railway honour roll and officially opening the Goulburn Railway Institute will be performed on Wednesday evening next by Mr Fraser, C.M.G., Chief Railway Commissioner. The Commissioner will arrive at the railway station at eight o`clock, and will be received by the Mayor as Chairman of the Honour Roll Committee. The roll, which has been placed in a position at the station, will then be unveiled. Goulburn Evening Penny Post (NSW), 26 July 1919.